Franco has been living in Western North Carolina for 11 years now. 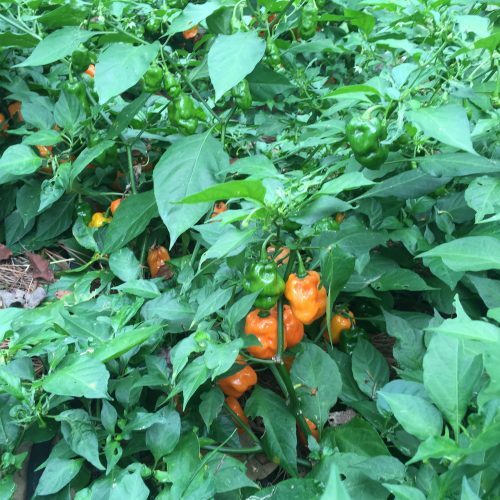 His adventure into hot sauce making began in his apartment kitchen. 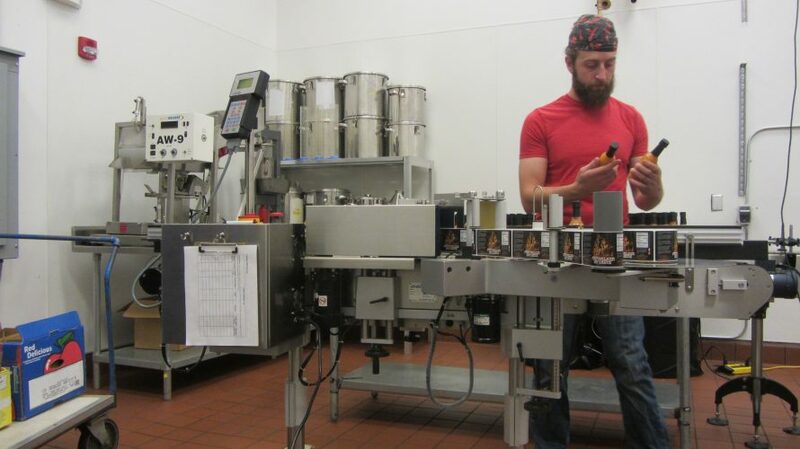 For 6 years, he would make a few bottles at a time, giving them to friends and family to try while also getting great feedback. Over the years he has experimented with various flavor combinations, some good and some not so good. Franco says once he perfected the recipes, his taste-testers tried to pay him for the sauce which encouraged him to take it to market. 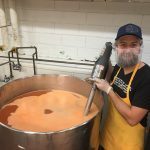 After a few years of this, he decided to take the plunge and officially started FIREWALKER Hot Sauce Company as a business to be produced commercially. 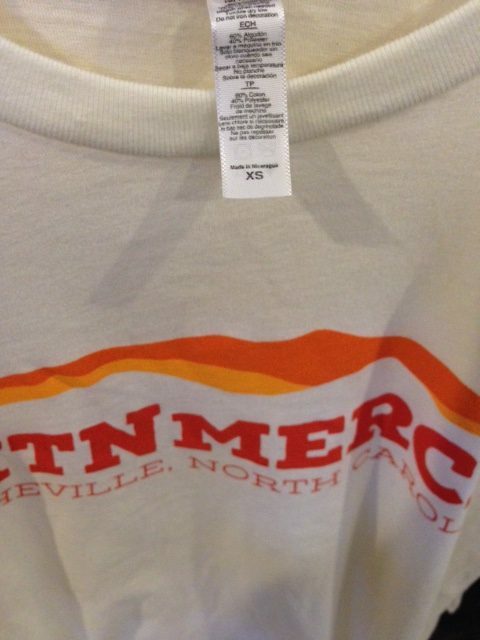 But why start a business in WNC? Not only were his friends and family ready to pay him for his hot sauce, but Franco also felt encouraged by the community support given to local vendors and producers. 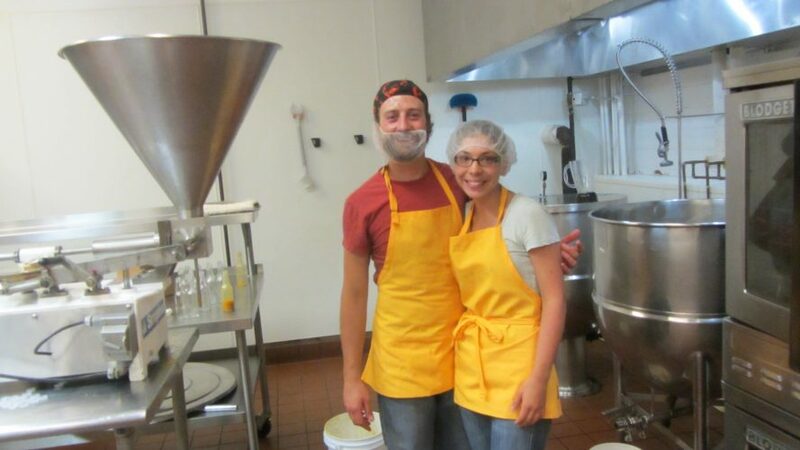 He is very proud of this culture which makes Asheville known on the national food scene and why not be part of it? 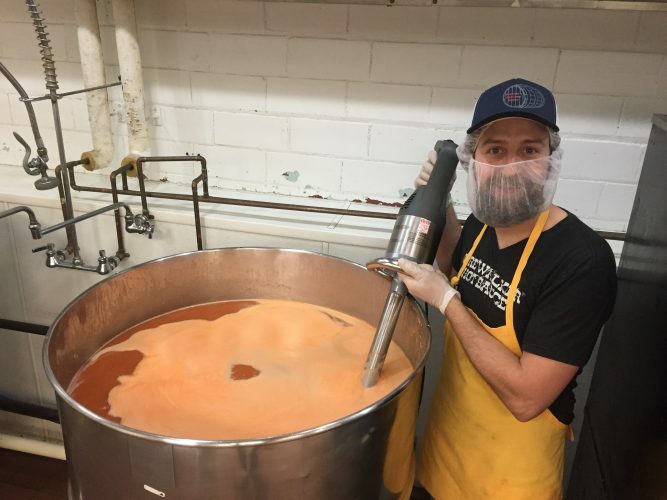 This area boasts fresh, unique flavors and consciously sourced ingredients that provide key elements to Firewalker’s small batch, hand-crafted hot sauce. Franco also realized the impact he could make in WNC restaurants and stores who would rather source from local entrepreneurs versus big box, hot sauce companies. 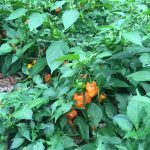 Fun fact about Firewalker Hot Sauce: Franco’s company grows almost all of its own peppers among its 3 family farms (Asheville, NC, Greensboro, NC and Blacksburg, VA). The company also sources many of its ingredients from the local farmer’s market. When Franco isn’t chopping up fresh peppers for his sauces, you can find him hiking and camping with his wife, 18-month old son, and 2 dogs. He also enjoys snowboarding, playing disc golf, and going to the climbing gym as much as possible. But most importantly, he and his family love to eat! They are always trying new restaurants and of course sampling the craft brews from all across WNC. 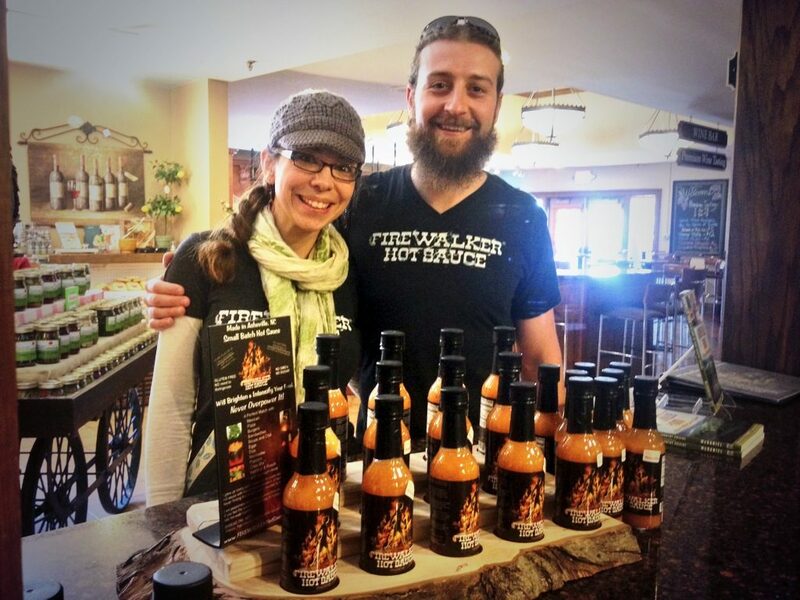 If you’ve been searching for that amazingly flavored, locally made hot sauce that was likely provided to you at a WNC restaurant, come on down to the shop to get your own bottle! We carry the original Firewalker Hot Sauce and the Running with the Reaper Xtra Hot Sauce. 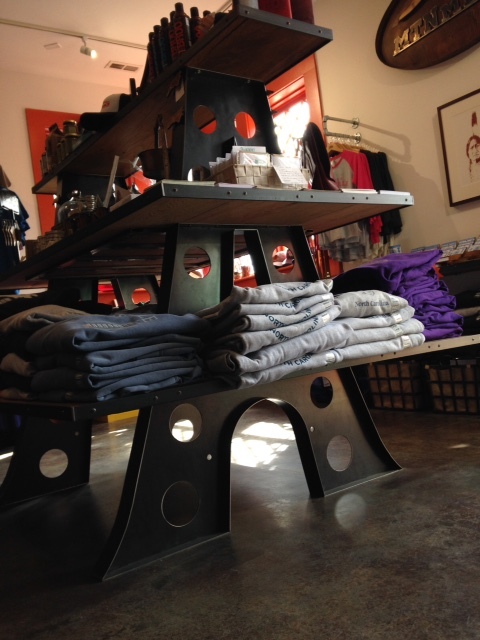 We are lucky enough at Mountain Merch to not only carry an incredible selection of Asheville themed apparel but we also have an incredible selection of talented artisans and craftsman that round out our shop with their locally made goods and gifts. We are very proud of the talented individuals and companies that have chosen to partner with us locally and we wanted to be sure and share a bit about their stories with you. We were introduced to Craig of Chestnut Forge and Furniture from our dear friends Joe and Lisa (McDinan) of Sanctuary Brewing Company, he was commissioned by them to create their tables, concrete bar top and other great fixtures that have a blend of hand forged steel and wood. 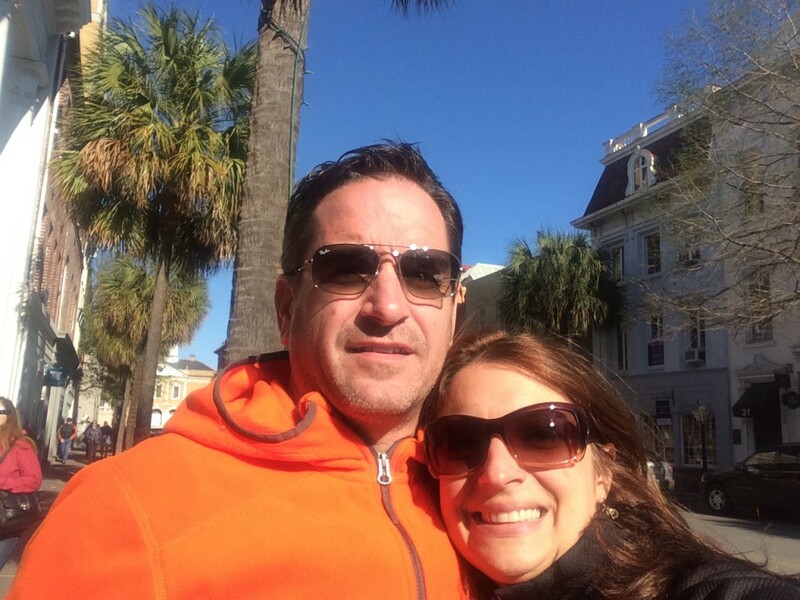 Joe and Lisa have been dear friends of ours and we happened to independently choose to open our businesses at just about the same time, so we have been able to learn and share a good bit with one another. They are committed to craft brews and rescues and have a great space, great beer (coming soon), music and community events that are focused on positivity and giving back in the areas of animal rescue and responsible living. Back to Craig. Craig is a retired Firefighter from South Florida who moved to Western North Carolina with his wife, Debbi 3 years ago. They built their farm and forge shop on a beautiful piece of property in Rutherfordton. Craig is a mentor, he has shadowed a few young folks who worked hard at crafting their skills, attending classes at Isothermal Technical and are continuing to grow in their skill level. Craig is somewhat of a savant in his own right. When we met him and were asking him to build us a few signs and a table that would hold some of our locally themed tee shirts, and locally made goods and a rack to hang NCline t-shirts, hoodies and apparel on we gave him quite a bit of creative freedom, as we just weren’t sure how to make it look great and be pieces of utility. For this piece we said, we want sort of a tiered picnic table – check out the detail – and the A for Asheville! Since the fixtures our discussions with Craig have continued to be as fluid as the steel being melted and formed. We love working with him because he and his team brainstorm with us on what we think locals and visitors to Asheville might like to take home with them. 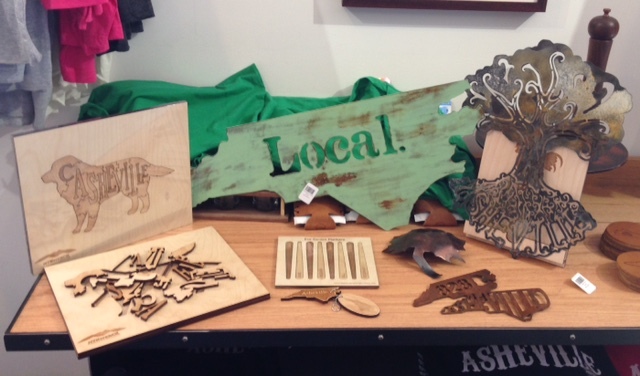 So far, he has made bottle openers in the state of North Carolina, decorative leaves, candle-holders and coasters. We have also worked together locally on some custom projects including this nifty collaboration between Ashevillain and Wicked Weed! Working with Craig and his team, the possibilities are endless. 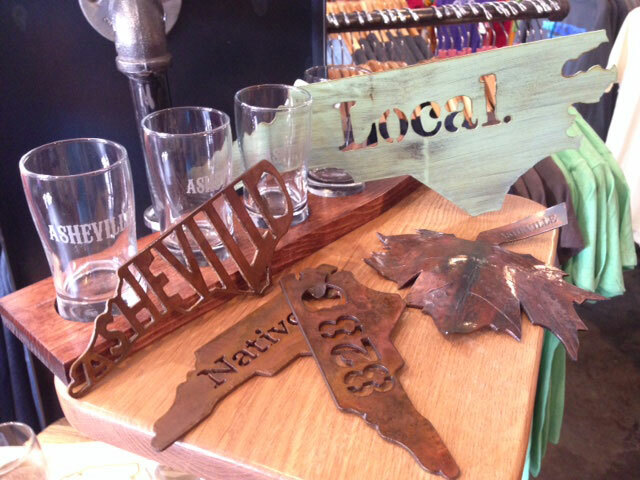 Whether you are looking for a piece for in your home, a local gift, something unique for your business, or a reminder of how amazing Asheville is please let us know (just visit our Contact Us page or come see us in person at our store in Biltmore Village!) we would be happy to start the conversation with you. This past weekend we were gathering sandbags, packing up anything that could get damaged – the art, custom woodwork and leather goods, and putting up all of the t-shirts, sweatshirts and Asheville apparel up above 3 feet. You might be wondering why? Well, we in Biltmore Village, like many other parts of the country, have been effected by the storm Joaquin. Asheville has been getting a ton of rain, coming down in buckets and because of where we are located, where the Swannanoa comes in to the French Broad River there was a threat of flooding which could potentially put Biltmore Village under water. Flooding, in Asheville… not possible? That is what many thought in 2004 when the Village was flooded with several feet of water, many lost everything. Friends of ours from the Village Wayside, share stories about cars being taken down the street by the water, people coming together to help one another and the shock and devastation. 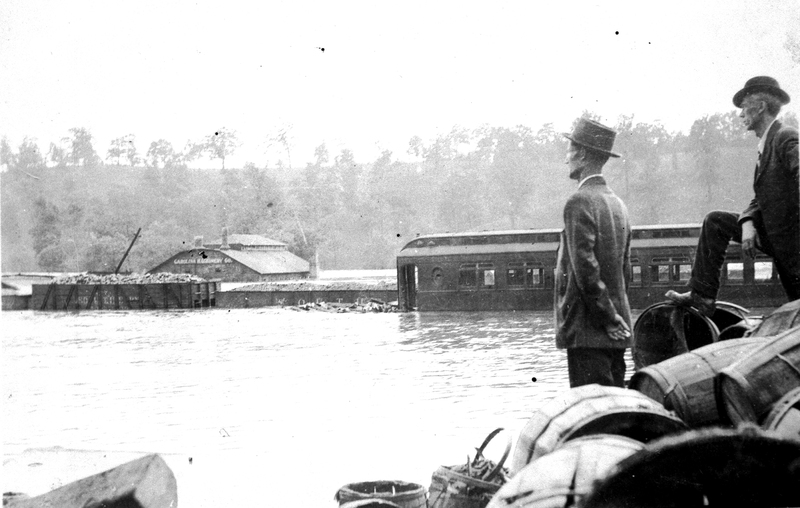 People weren’t prepared at that time because Biltmore Village hadn’t seen a flood since 1916 and even that was unfathomable. Here is a partial account from Kathleen Lipe Carter (1898-1989) – “Before dawn on the 16th, my sister, Bess, and I found Papa securing some chickens and turkeys on the front porch. Already, sightseers from the village were wading near the house to view the swollen river. With Papa, we joined a group of forestry students and young people heading into the village. To my surprise, as we crossed the train tracks, the water became deeper, the current more swift. Our group held hands, keeping our backs to the current, and struck out across the Village Green, hoping to reach high ground beyond the lodge gate to the Biltmore Estate. By the time we reached Lodge Street, the water was almost over our heads. Torrents from broken dams upriver had changed the course of the Swannanoa. We were caught in the middle of a wide, wild river” Story by MainStreet Online feature writer, Lyn Leslie. As I watch the news and see the current devastation in our sister city of Charleston, SC my heart aches for each and every person who is under water, without power, without a roof over their head, or a safe place to sleep. I am caught off guard by the pastor shown pulling a casket across a former street turned into a river, “that is someone’s family out there”. I am comforted to see people lending a hand, being human and serving one another in need. It inspired me to help a homeless man who was just drenched, sharing some clean clothes and a rain jacket, I think his smile said it all, but he was just grateful for someone to notice him. Luckily for us, even though we broke the record for amount of rain in a day at 2.23 inches, beating the old record from 1961 of 1.63 inches flooding didn’t happen; we got a chance to sweep and mop in all of corners! Be good to one another, be grateful for a warm dry place to lay your head, be brave to offer a lending hand or even just a smile and hello. Be human folks. There is some old adage about planning, but it never really stuck with me. This explains why I married Greg. When you are getting ready for a Grand Opening, there are all kinds of resources out there about how to plan, what to do, how much to spend, how to market, etc… However, what they don’t tell you is to confirm your sign will be ready (or else it will drive your husband go crazy). In my mind, the word still gets out and the doors are still open and hopefully kind folks like you will stop on by and check us out even with our temporary sign. But, I could be wrong. I do believe you only get one chance to make a first impression (apparently that one stuck). Signage, having your brand defined and your customer service top notch are all apart of the equation however our sign is the lowest on the list. What do I want to happen when you come in to MTN Merch? I want you to be welcomed warmly, I want you to be briefly informed about our store without feeling pressured or pushed, and most importantly I want you to leave saying, “that was a really neat store and those folks were really nice.” Of course, I want you to say we are the best place to find apparel – T-shirts, hoodies, caps, sweatshirts, stickers that will appeal to kids, adults, teens, tourists, AND locals. I would also like you to find our store unique in it’s boutique style, reclaimed barn wood, steampunk type fixtures and locally made leather, hand turned wood, made in Asheville soaps, lotions, hot sauce and gourds. All under one roof, even without an official sign, in the historic Biltmore Village. Perhaps it’s too simple in my mind, which is why we have t-shirts and water bottles to giveaway, will have music and are running ads… but it all boils down to service and experience. We can’t wait to celebrate our Grand Opening this 4th of July weekend with you, our neighbors and visitors (just don’t mention the sign). To me, there is nothing romantic about starting a retail shop. I grew up working in retail and then moved into the service industry waiting tables and bartending throughout college. The hours, the complaints, the demands- it never stopped. Greg has worked retail too, but he looks at things much differently; we don’t share the same fears. However, one thing that I know is true, while both of us have been working full time and then around-the-clock opening our brick and mortar shop while building a website simultaneously, is that we have found a new romance—with each other. I should back up slightly. We have only been married for two and a half years so we aren’t in the romance-rekindling phase of our relationship just yet. Our story began about eight years ago and our journey brought us to Asheville, where we were both laid off right before we were married (the Asheville curse maybe?) Greg had spent 20 years in the apparel industry and I in recruiting and sales, so we looked to somehow reinvent ourselves in our new marriage. The retail shop had always been something Greg was drawn to here in town and after talking about it for a few years, the timing was all of a sudden, right. So here we are, in the thick of it, picking products, paint colors, inventory systems, photographers, designers and hiring new employees for the store. Meanwhile, the “did you feed the dog?” “holy crap, why is there water coming through the ceiling?” “where is Cash?” and the “did you eat today?” conversations continue. Do you know what I realized? While I have almost none of the same key skills as my husband, we are alike in so many ways. We’re both outgoing, gregarious, fun, loving, hardworking, and maybe a bit brash at times, too. But he is my best friend. 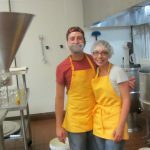 And without trying to sound cliché, I don’t know if I ever fully understood just how great he is at what he does – and I may have never known had we had not started this business. I didn’t give him half the credit I should have (and do now) and no matter what happens, I know that I will never look at him the same again. Now that I know what he is capable of, on top of being the man I married and love, I am certain we will be successful and I couldn’t be more grateful to be a part of this journey as a team- husband and wife. One of the greatest things about Asheville is its sense of community. It doesn’t matter what you do for work around here; instead, it matters how you choose to have fun, get involved, and invest your time for other people. Asheville sparks something in its community: a light of appreciation and giving. Greg and I have always been involved in charities and volunteering and it’s certainly true that you attract those that are like-minded. Here in Asheville, it is much more prevalent that the majority of people are involved in something beyond their own needs, wants and individual lives. 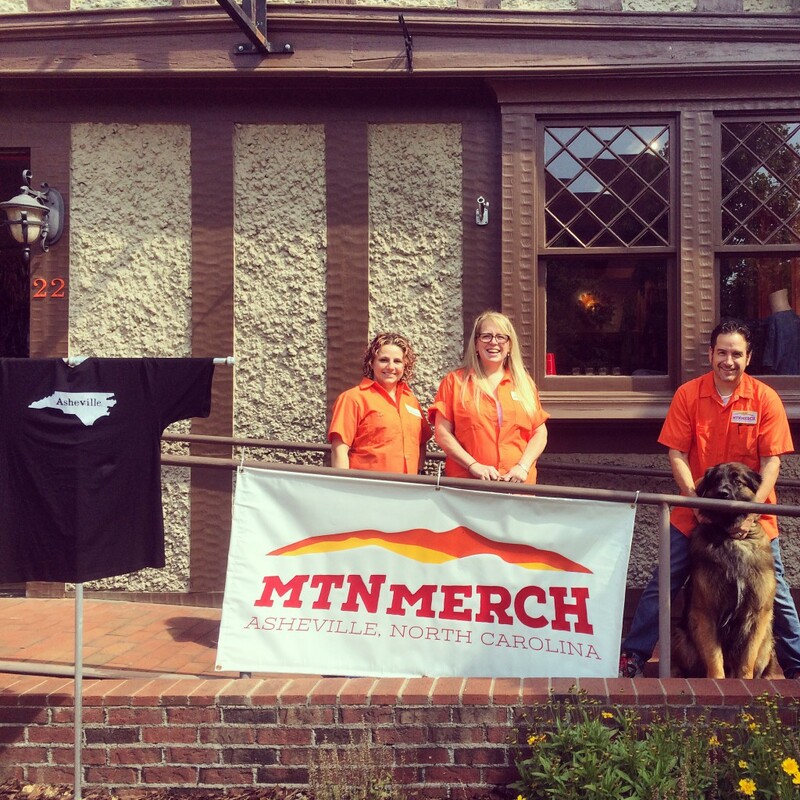 This overwhelming sense of community is what sets Asheville apart from the rest. Because community is a huge priority to us, we want to offer something that incorporates both charity and the opportunity to connect with local artists (the talent in this town is abundant). Therefore, we will be taking submissions from local artists that create a design inspired by the charity of the selected time period (which may shift based on sales, timing, etc…). 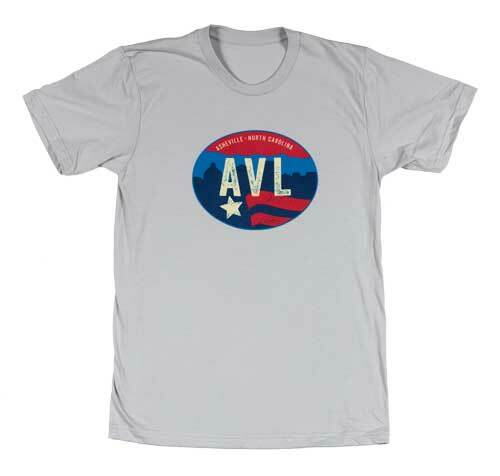 With that being said, the first shirt has been designed by South Paw Graphics, Randall Chet to remind you of both this great country we live in and also the men and women who have worked to protect our freedoms and the mountains of Asheville. 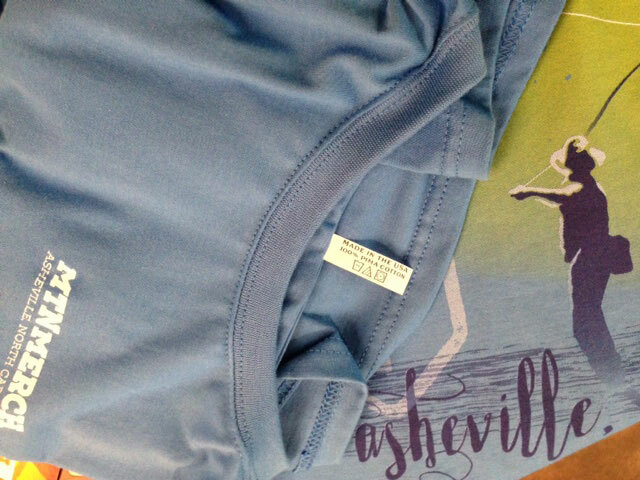 This shirt has been produced in limited quantities on a made in the USA shirt; $8.00 per shirt will be donated to Homeward Bound for Veterans Assistance, which works to find homes for homeless Veteran’s here in Buncombe County. Danielle’s grandfather was a Veteran and has a cousin on his 5th tour, so we hold this cause close to our hearts. We both also have a number of friends who are serving or have served and seen the difficult transition to civilian life that can happen for so many of these courageous people. It is a terrible reality that these men and women can return from a long, tough road to no home, family, or a number of other challenges. Even if we can make a small change, spread awareness, or inspire others, we will have done something! When you work to improve the lives of others, your life improves automatically. Join us in our journey of giving back to the community that gives so much to us.